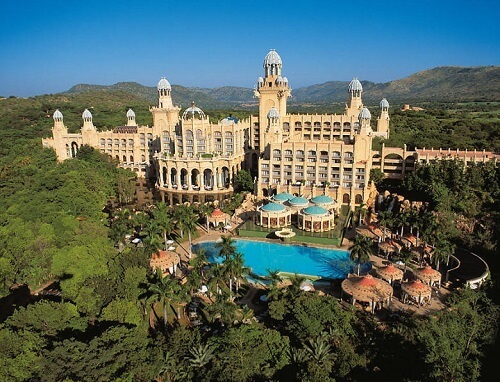 Sun City Casino is one the popular casinos and leading entertainment destinations in South Africa. The casino is located in Rustenburg roughly 165 kilometres from the city of Johannesburg. It is part of Sun International Group. Sun City attracts both locals and international visitors looking to have a good time. No doubt it is among the best due to its breathtaking facilities, games, customer service, security, welcome bonuses and more. It is one of the most visited tourist attractions in the country. Sun City Casino facilities offer entertainment to both kids and adults. There are a lot of things you can enjoy when you visit Sun City including entertainment acts, cinema, water slides, beauty spas, restaurants, clubs and more. The casino is one the best in the country and the whole Africa. Unforgettable superb gaming experience is absolutely guaranteed. Sun City Casino is open 24 hours and 7 days a week. It is a secure environment to enjoy your gaming, every moment is closely monitored by the casino’s security personnel. With over 850 slot machines spread all over the casino, players have a wide range of games to choose from. The slot machines denominations start from 1 cent up to R100 and bets ranging from R10. This means that everyone can have a good time. The casino offers different bonuses and promotions to players. Slots machines and gaming tables are strategically placed in the smoking and non-smoking areas in the casino. Players can join Most Valued Guests (MVG) for free. MVG players can enjoy different types of benefits and rewards including loyalty points and VIP treatment. You can walk out of the Sun City a millionaire, it offers progressive jackpots that are worth millions of Rands. The casino complex has some stunning restaurants and bars that can make you fall in love with the place with just one visit. You can enjoy your favourite meals at different restaurants and if you are looking forward to burning some calories after eating, vibrant dance floors in the clubs can help you out. Kids can also have a good time at the resort through a number of activities offered at Sun City such a waterslides, movies, theatre acts and live music. Check out other popular land-based casinos in the North West province on Casino ZA.